This week I sold my iMac. I now no longer own a desktop computer, for the first time in 20 years. I’ll get to why at the end, but I thought it might be fun to take a look back over these 2 decades of my personal PC history. My first computer was an IBM PS/1. It was 1993 and I was 14 years old. There was no computer in my house growing up before this time so I’d been spending a lot of time in the school computer lab. 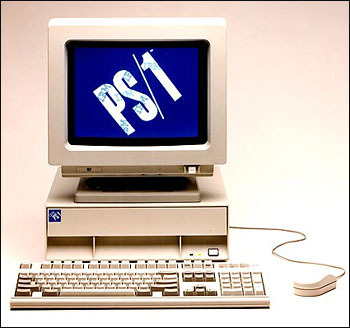 This PS/1 was a great machine. Its initial spec was 486 DX 33 processor, 4MB RAM, 170 MB hard disk with a 14″ monitor which I typically ran at 800×600 resolution. For the time this was a pretty decent set of hardware. It ran Windows 3.1 and IBM’s ‘PC-DOS‘ 5 (simply MS-DOS 5 rebranded.) It never developed a fault while I was using it. It was my PC through to the end of my time at high school. It had a few upgrades over these years including a sound card (natively it only had the fairly useless PC speaker), a RAM upgrade to 8MB, a hard disk upgrade to 420 MB, adding a CD-ROM drive and various OS updates, the last being Windows 95. By the summer of ’96 it was time for me to go to University, and I bought a new PC for the move. This was the first PC I built myself and from here on for the best part of a decade I was forever tinkering with my computers. As such my memories of specs get a little hazy. I do remember that the original incarnation of my first University PC had a Cyrix 6×86 processor – this was a mistake. The Cyrix chip was slow and crashed frequently (apparently they had heat problems.) I suffered through for the best part of a year before giving up and getting a new CPU and motherboard. In the first year at college I networked my PC for the first time – using a very long serial-port null modem cable to my friend (of then and now) Mike Mason‘s computer, who lived in a room about 50 feet away. We played Quake against each other and also amazed ourselves at being able to eject the CD-ROM drive of the other person’s machine. We clearly needed to get out more. Around this time I started using Linux, starting with the Slackware distribution. In our second year at college Mike and I shared a house with a few friends, so the networking in my machine got upgraded to have a BNC ethernet card. It was around this time that storing music as MP3 format started – it used to take 2 – 3 hours to rip a CD on my computer. Winamp was the music player of choice. I had an Iomega Zip drive which allowed me for the first time to move my data around physically on something with more capacity than a 1.44MB floppy disk. The Zip drive, like so many of the time, was thrown out when it developed the infamous ‘click death’. USB memory sticks are far superior. In my third and final year at college I moved back into college accommodation which came with a LAN-speed internet connection. This was a huge benefit. I was pretty concerned about having my PC hooked up straight to the internet though so I bought a second desktop PC to act mostly as a firewall and secondarily as my Linux machine. This required me to get a bit more serious about my Linux usage – I wouldn’t like to guess how much time I spent recompiling kernels that year. A bunch of us across the university had network-connected PCs and setup what we would now call a VPN using a combination of CIPE and NFS. With this we could transfer files between each other without the university network being able to tell what we were doing. We were very proud of ourselves for doing this and still needed to get out more. I continued tinkering with my tower-case enclosed PCs over the first 3 years or so after college. I also bought my first laptop around this time. In 2002-ish I bought my first Shuttle ‘small form factor’ PC. This was a speedy machine, and also (for the time) tiny. I added a 2nd Shuttle to allow further tinkering. In 2003 through spring 2006 I did a lot of moving of countries so my desktop computing adventures slowed down here. In ’05 I bought my 2nd laptop, my 2nd Sony Vaio. At the end of 2005 I did buy my first Mac – a G4 powered Mac Mini but this was mostly as a ‘media PC’ rather than a serious desktop computer. 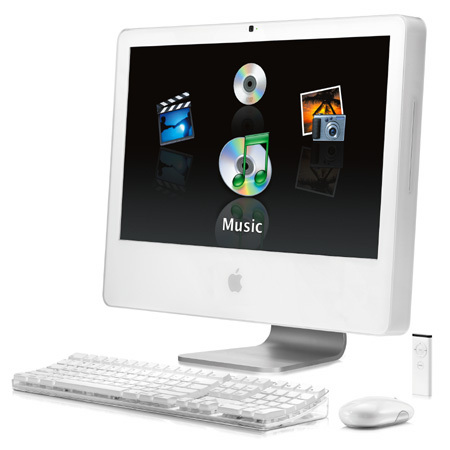 In late 06, now living in New York, I bought my last desktop computer – a Core 2 Duo powered iMac. The biggest (literally) thing about this machine to me was its screen, all 24 inches of it which to me at the time seemed stupidly huge. This was also the first time I seriously used a Mac. Despite being frustrated at first with Mac OS I soon got the hang of it and wondered what I’d been doing to take so long to start using a Mac. The iMac was great and I was still using it through until last summer – not bad for a 6 year old machine. In this period I only upgraded one piece of hardware – giving it a slight RAM upgrade to 3GB. My years of constant hardware tinkering were over. Last summer I bought my 3rd laptop – a fully specced MacBook Air. This machine is screamingly fast and hooked up to a 30″ display easily does everything I need. The iMac was consigned to the floor of the spare room where it sat until this week and I sold it. I still find it amazing that a machine of the diminutive proportions of my MacBook Air can perform like it does. Comparing it with my first machine it has a CPU roughly 500 times more powerful (by BogoMips), 2000 times more memory and 3000 times more disk space (and that’s with using an SSD). Truly we are living in the future.